The £9000 question is coming back to bite the sector. There’s something about the uniformity of English undergraduate tuition fees being nearly universally set at £9250 that upsets people, particularly policy makers. Is this because it shows the failure of a market on the basis of price? Or simply because it offends an English sense of hierarchy that the fees are so similar? The costs of higher education certainly used to be variable – the founding of the 19th century civic universities was very much about making affordable education available (although it was the costs outside tuition that dominated). This continued into the 20th century, with Oxbridge being considerably more expensive than provincial universities. Undergraduate education, especially in its full-time mode, has become highly regulated. In England, the funding council evolved a series of measures to fund courses on a similar basis. Any additional cost could not be passed onto the student and would not be met by HEFCE. Some universities have sufficient endowments to allow them to spend more, but these are rare. As graduate contributions have been introduced, the ‘fee’ has been highly regulated. In effect the state funds university teaching by sending a sum of up to £9250 for each student, with premiums and top-ups for some subjects. This is unlike other forms of fee, more like a voucher, but it would be sophistry to try and state that it’s not actually a fee. I remember well the discussions had in universities when the government allowed a variable fee cap; at first £3000 but later £9000. Each university worked out its own position (no cartel) and applied the same logic. No doubt each went through the same logical steps, and it’s worth noting that a large number of different positions were reached – especially in the first year. Although variation on the ‘sticker price’ was limited, there was, and still is, a huge variation in the actual price with bursaries and fee waivers. When the fee cap rose to £3070, the bulk of Universities charged that as their fee. For Leeds Met, the ‘low charging, high impact’ approach survived for four intakes, but fee went to the maximum very soon after Lee’s departure. But Vince was wrong. It was not a cartel that drove fees to £9000, but the logic of the system. Helpfully David Willetts now understands this. At the fees debate held at the Resolution Foundation, he summed up the arguments that each university went through in 2010/11 before emerging with their fee proposals. Fees don’t vary because it is illogical to do so. Why turn away funds for courses? That makes no sense and it additionally looks bad to applicants (who really wants a cheap degree?). As Leeds Met tried with the £3000 cap, London Met tried with £9000, with a range of variable fees, from £4500 upwards, but anticipated to average at £6850. This approach lasted for three cohorts, but for 2015 the university concluded it would raise fees to £9000. Perhaps a university in a more robust financial state might have held out longer. 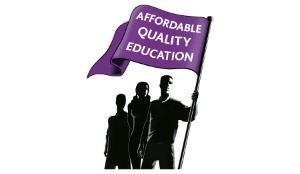 But, you can’t say they didn’t try; even down to the advertising campaign on ‘affordable quality education’. There’s much focus on whether ‘cheap’ courses should attract a lower fee. Complex (especially with combined courses) this comes back to trying to cost the course as opposed to funding the university. No one likes overheads, but a degree doesn’t just cost what it takes to put a lecturer in a classroom. No doubt there will be more focus on the return on investment argument, but past averaged earnings is a lousy way of guesstimating what the initial charge should be. The repayment system takes that into account – why try take the average of recent English graduates, say, and turn that into an up-front price? It’s highly arbitrary and within the regulated fee system hard to justify. Should a subject such as economics, whose students might, on average, earn more than those in biological sciences, charge more? Should the fees from economics then be used in part to pay for higher cost courses? The biggest concern, of course, is causation. His degree in Countryside Management is not the cause of the wealth of the Duke of Westminster. Should all fees in the North East be lower because graduates who stay there are paid lower on average than those in London? The week that the idea of forcing variability of fees was floated in the Sunday Times, they had a MBA guide among the many sections. This shows that universities are very happy to vary fees outside the regulated system. MBAs come in all sorts of varieties and all sorts of prices. No doubt there are all sorts of differences between the 12 month FT MBA at Kingston and the 21 month FT MBA at London Business School – but the difference in price is £64,450. Conformity in fee level is the result of the regulated fee system. If the goal is really to have variable fees, then government and parliament would need to let go. This is highly unlikely – the basis of undergraduate fees is written into primary and secondary legislation. Even a measure such as relaxing the rules for accelerated degrees has been put into statute (which will constrain options for universities). Moving the ‘sticker price’ will have to be matched by those fee waivers and bursaries – will bursaries for poor students go down if the fee is forced down? As we hear more of plans for any forced variation, remember that it’s the regulation that diminishes variation – not a cartel.